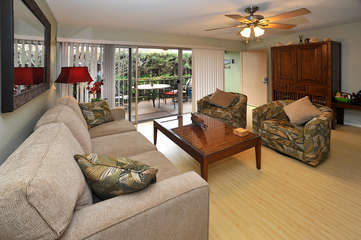 Unit #17 is a first-floor garden unit is where Tommy Bahama meets traditional Hawaii! Remodeled in 2014, this quiet unit, the quietest and secluded in the complex features hardwood floors, cool tropical colors, stylish fans, and the latest technology split-system air conditioning system that allows separate temperature controls for each room while making less noise than the ocean waves, which are only a few steps away. It also features a King bed in the bedroom and a Queen mattress in the living room sofa where a new mattress and frame were installed July of 2014. 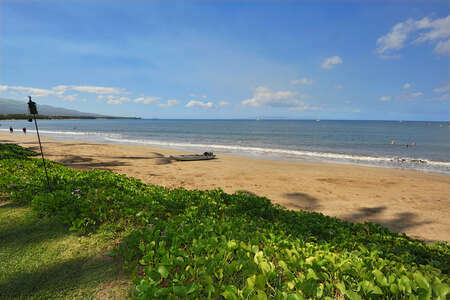 Either mattress will help you to slip into the Hawaiian time zone with your first night's sleep! It also features a complete kitchen with all the dishes, pots and pans, small appliances, glasses, and utensils any guest could ever want. The large appliances are all full-size, including a refrigerator, dishwasher, and oven, just in case you're in the mood to bake some authentic Hawaiian banana bread! Lastly, the Lanai is beautifully decorated and so tranquil you'll forget the rest of the world exists. Don't look now, but there may be a Gecko watching you!